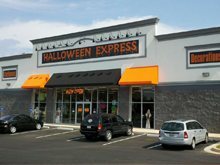 Welcome to Halloween Express of Austin, TX! Whether you want to find the scariest masks, funniest costume, or the creepiest prop, Halloween Express in Austin is the place to stop this upcoming 2016 season. We look forward to serving you with the best selection of costumes, props, decorations and accessories! For the 2016 Halloween season you can find us in the Arboretum Crossing Shopping Center at the intersection of Mopac and 183 in front of Toys R Us/Babies R Us and Five Below. Welcome to Halloween Express of south Austin! For 2016, we will once again be carrying the largest and most complete line of Halloween costumes, masks, props, and accessories on the planet! You can find us on Slaughter Lane, one mile WEST of I-35, at the intersection of Slaughter Lane and Manchaca Blvd (in the HEB center, behind McDonalds). Look for the signs that will lead you right to our door. We are ready to help you make Halloween 2016 the best Halloween yet! 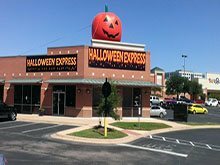 Welcome to Halloween Express Austin, TX! Whether you want to find the scariest masks, funniest costume or the creepiest prop Halloween Express in Austin is the place to stop this upcoming 2015 season. We look forward to serving you with the best selection of costumes, props, decorations and accessories! For the 2015 Halloween season you can find us in the Arboretum Crossing Shopping Center at the intersection of Mopac and 183 in front of Toys R Us/Babies R Us. We are currently closed for the season, but would like to wish all our customers a safe and fun summer! 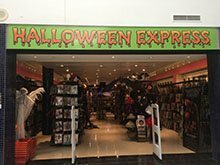 Halloween Express of Houston, TX is excited to return for another great Halloween season in 2016. We will once again offer you the best selection of costumes, decorations, masks and accessories. You can find us on the southwest corner of Westheimer and Gessner, next to LA Fitness and Rug & Decor Outlet. 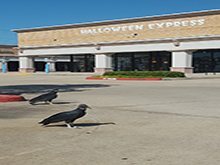 Welcome to Halloween Express Houston, TX! We will once again be proud to carry the largest selection of Halloween costumes and merchandise in the Houston area! Stop by and visit us in the Willowbrook Plaza Shopping Center at 249 and Gessner next to World Market and Bed Bath & Beyond! We will be ready to help you with all your Halloween needs for the 2016 season. Welcome to Halloween Express Shenandoah, TX! Whether you want to find the scariest masks, funniest costume or the creepiest prop Halloween Express in Katy is the place to stop this upcoming 2016 season. We look forward to serving the customers of Shenandoah, TX with the best selection of costumes, props, decorations and accessories! Come by and see us soon for all your Halloween needs! You can find us in the Portofino Shopping Center off of I-45 North. We look forward to helping you with all your Halloween needs. Welcome to the Halloween Express of Sugar Land, TX! We can't wait for this upcoming 2016 Halloween season. We will once again offer you the best selection in costumes, decorations, masks and accessories. We are excited to announce we will be in the Market at Sugar Land Town Center at Highway 6 and Town Center Boulevard this year. Be sure to stop by and shop our great selection!